SALIBA -Veritable Representation des Premieres Matieres ou Elements avec leurs Directions. . .
SALIBA, A./ SCHEVENHUYSE, A. - Veritable Representation des Premieres Matieres ou Elements avec leurs Directions. . . Veritable Representation des Premieres Matieres ou Elements avec leurs Directions. . . - SALIBA, A./ SCHEVENHUYSE, A. Title : Veritable Representation des Premieres Matieres ou Elements avec leurs Directions. . ..
Map maker : SALIBA, A./ SCHEVENHUYSE, A.. Date : Haarlem, 1650 - 1700. Size : 22.8 x 20.9 inches. / 58.0 x 53.0 cm. 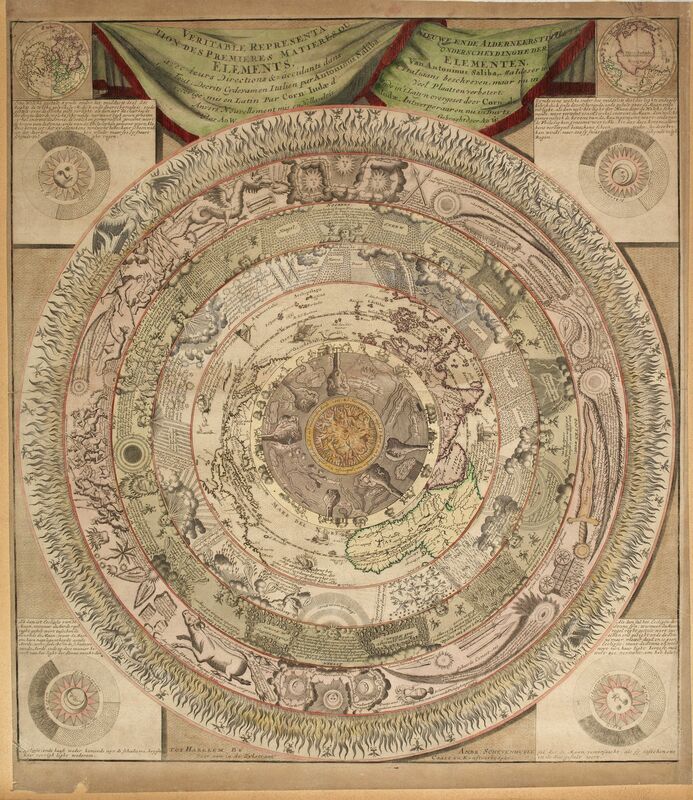 Description :A very rare double-page engraved circular representation of the world depicted in circular layers with Hell at its core, consisting of 9 concentric circles including the northern hemisphere, circle of fire, comets and stars, the heavens, stars and clouds and the subterranean world. Re-issued and re-engraved for the Dutch market by Ambr. Schevenhuyse, after A. Saliba, A.D W and Cornelis de Jode (c1568-1600). Originally published in Italian by Antonio Saliba in 1582. The Herzog August Bibliothek (Niedersachsen, Germany) possesses the only recorded example. In 1593 Cornelis de Jode issued a second edition in Latin, of which no examples are known. Shirley also cites re-issues of the de Jode edition by Paul de la Houve (ca. 1600), Jean Messager (ca. 1640), Pierre Mariette (ca. 1640) and Gerard Jollain (ca. 1681), all based on the de Jode edition. There is only one recorded example of each of the four. Shirley, Mapping of the World, 226 and 146 (Saliba), 185 (de Jode et al.). Tooley, Map Collectors Circle, vol.1 no. 1, #25-26 (illustrating the de la Houve and Schevenhuyse issues). Whitfield, The Image of the World, p.70 (Saliba issue). Condition : Laid down on card board. Short left hand margin and a few marginal tears. Good impression.